Developed a Custom FontDialog as an alternative to the standard .Net FontDialog. Key advantage of CustomFontDialog is the full control over look and feel as it is open source. Source and binary files are available at sourceforge. CustomFontDialog avoids ‘This is not a True Type Font’ exception that affects the standard dialog in some cases. Most probably the exception happens when some installed fonts have invalid meta information. This exception cannot be caught using try/catch block because the exception is thrown from the code outside .Net framework. The exact exception message is ‘Only TrueType fonts are supported. This is not a TrueType font.’. CustomFontDialog gets around this problem by loading only True Type fonts. More details about the problem with standard dialog can be found here and here. Moreover, CustomFontDialog provides easy access to recently used fonts by moving them at the top of the list in ‘Recently Used’ section. Following C# code snippet demonstrates how to instantiate and display Custom FontDialog. For the CustomFontDialog to retain the recently selected fonts at the top of the list, the dialog should be instantiated only once and ShowDialog function should be called on the same object whenever the dialog needs to be displayed. To programmatically add Fonts to be ‘Recently Used Fonts’ section, call AddFontToRecentList method. Limitation: As compared to the standard FontDialog, CustomFontDialog doesn’t support changing text color. 1- In Font List, arrow keys can be used to move between ‘Recently Used’ and ‘All Fonts’ sections. 2- When user starts typing in Font List, the focus shifts to the filter Text box automatically. 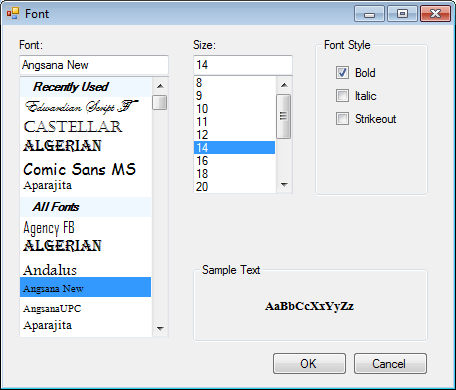 3- Whenever CustomFontDialog is displayed, the focus is on Font List by default. It seems like you are using class name rather than object reference to get the Font property. Could you share the piece of code where you are using FontDialog?